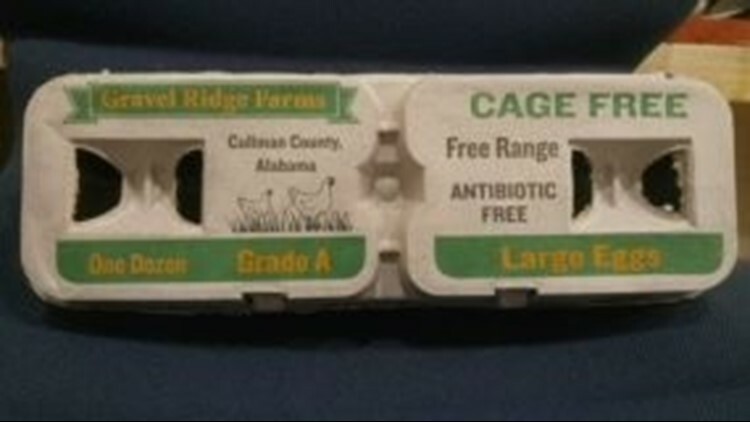 Recalled eggs were sold in grocery stores and to restaurants in Alabama, Georgia, and Tennessee. So far, 14 people have gotten ill.
ATLANTA — An Alabama farm has recalled its eggs after the CDC linked them to a multi-state salmonella outbreak. According to the Atlanta-based CDC, eggs from Gravel Ridge Farms in Cullman, Alabama could possibly be contaminated. On Sept. 8, the CDC said Gravel Ridge Farms recalled packages of a dozen and 2.5 dozen eggs in cardboard containers with UPC code 7-06970-38444-6. Recalled eggs have “best if used by” dates of July 25, 2018 through Oct. 3, 2018. Recalled eggs were sold in grocery stores and to restaurants in Alabama, Georgia, and Tennessee. The CDC is urging anyone who may have bought the eggs affected by the recall to any Gravel Ridge Farms eggs to the store for a refund or throw them away, regardless of the “best if used by” date. The CDC says even if some eggs were eaten and no one got sick, do not eat them. In addition, the CDC is encouraging consumers to wash and sanitize drawers or shelves in refrigerators where recalled eggs were stored. As of Sept. 7, 14 people have been infected with the strain of Salmonella Enteritidis in both Tennessee and Alabama. No deaths have been reported. Most people infected with Salmonella develop diarrhea, fever, and stomach cramps 12 to 72 hours after being exposed to the bacteria. The illness usually lasts 4 to 7 days, and most people recover without treatment.